The item Before He Sins, Blake Pierce, (electronic resource) represents a specific, individual, material embodiment of a distinct intellectual or artistic creation found in San Francisco Public Library. From Blake Pierce, bestselling author of ONCE GONE (a #1 bestseller with over 900 five star reviews), comes book #7 in the heart-pounding Mackenzie White mystery series. 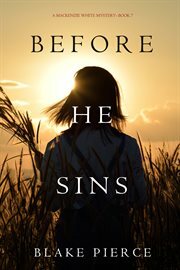 In BEFORE HE SINS (A Mackenzie White Mystery-Book 7), priests are turning up dead, their bodies found crucified against church doors throughout Washington, D.C. Could this be some sort of act of revenge? Could it be a member of their order? Or a serial killer, hunting priests with a far more diabolical motive? The FBI turns to special agent Mackenzie White, as the case bears a resemblance to the religious overtones of her first case, The Scarecrow Killer. Plunged into the subculture of the priesthood, Mackenzie struggles to learn more about the rituals, about ancient scripture, to try enter the killer's mind. But Mackenzie is already preoccupied by her hunt for her father's own murderer, determined to find him this time. And this new killer is more sinister than most, and will push her, in his deadly cat and mouse game, to the very brink of her own sanity. A dark psychological thriller with heart-pounding suspense, BEFORE HE SINS is book #7 in a riveting new series-with a beloved new character-that will leave you turning pages late into the night. Also available by Blake Pierce is ONCE GONE (A Riley Paige mystery-Book #1), a #1 bestseller with over 900 five star reviews-and a free download!